This collection offers a new way of looking at neoliberalisation and new understandings of contemporary processes of professionalisation. This collection offers a new way of looking at neoliberalisation. Presents new understandings of contemporary processes of professionalisation. Draws on new, original research. Features studies from the Global North and the Global South. Nina Laurie is Senior Lecturer in the School of Geography, Politics and Sociology at the University of Newcastle, UK. She works collaboratively with colleagues at CESU, San Simón University, Bolivia. Together with Robert Andolina and Sarah Radcliffe she is author of Multi-ethnic Transnationalism: Indigenous Development in the Andes (forthcoming). She is also co-author of Geographies of ‘New’ Femininities? (1999). Liz Bondi is Professor of Social Geography at the University of Edinburgh. She is founding editor of the journal Gender, Place and Culture, the co-author of Subjectivities, Knowledges and Feminist Geographies (2002) and co-editor of Emotional Geographies (2005). "This is a compelling, timely and thought-provoking collection. It brings into contact a range of phenomena often considered in isolation, and subjects them to sustained critical-geographical exploration. The materials covered here cross worlds and scales - the Global South and the Global North; from the psychotherapist's couch to ethnodevelopment in Ecuador - and thereby reveal the entangled spaces, roles and subjectivities of professionals and activists under neoliberalism. It is essential reading for any critical scholar concerned about the extending and mutating reach of neoliberalism." "If there is any lingering doubt that geographers need to think about how the local, the state, and the global are interconnected, it should be dispelled in this provocative and compelling collection, a fresh approach to the everywhere but elusive concept of neoliberalism. 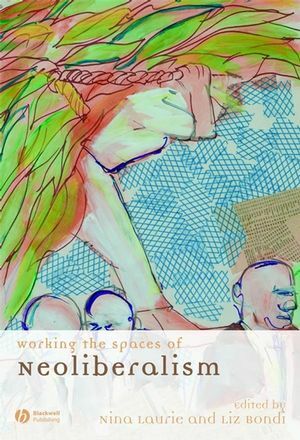 Challenging us to think about the broad ramifications for professionalism and local activism, these authors are determined to make a difference to the real lives of people engaged in working the spaces of neoliberalism as they re-write subjectivity, local knowlege, sexuality, democracy and political agency. We can definitely add another notch to our understanding of the world." Explores the central characteristics of neoliberalism found in social democratic regimes including economic liberalisation and an emphasis on ‘‘rolling back the state’’.